THE WALKING LEADER: The 20 Rules You Can Follow Now To Guide You Down The Path Of Leadership Greatness In Your Organization. If you have been in the business world for more than five minutes you know just how important it is to get out from behind your desk and start walking. Walking around the organization is the only true way to know how things are going. This is such a great story, and terrific advice to any manager and leader. No matter what industry you find yourself working in, the only way for anyone to get a first-hand account of how things are going is to get out where things are happening. Walk among and talk with the men and women of the organization, especially those who are not in your department or area of responsibility. Over the years, many great business leaders, professional, authors and countless other told us that it was the right thing to do. However, what they failed to tell us was how to go out there and walk around. All they ever said was get out and do it. So I decided enough is enough and I put together 20 rules that anyone can follow. These 20 rules were designed to be easily put into use and modified to suit your particular situation and needs. Then again, you might not need all the rules or you may need more. Thus, the Walking Leader gives you a base to start from and grow with. The Twenty Rules of the Walking Leader are: 1. Do it to everyone. 2. Do it all the time 3. Go by yourself. 4. Do not circumvent any manager, ever! 5. Ask questions. 6. Look…Listen…Learn 7. Share well with others 8. Try out their work 9. Bring good news 10. Catch them in the act of doing something right 11. Correct On The Spot 12. Make Sure It’s Not All Business 13. You Are Not A Spy 14. Employees Must Know You Are Available 15. Solicit And Act On Suggestions 16. Promote Others To Do The Same 17. Be Visible 18. Be Genuine and Be Authentic 19. Be Patient 20. Have Fun! 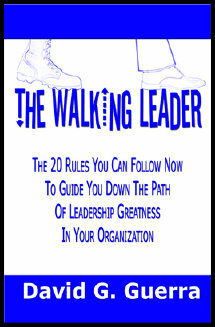 Download your copy of The Walking Leader for the Amazon Kindle. Order your paperback copy of The Walking Leader.